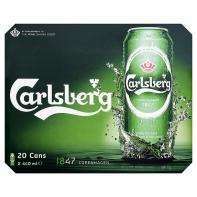 First deal posted, Asda are doing cans of Carlsberg 20 pack for £10. 50p a can, I purchased from Robroyston and can confirm this is nationwide as it is online too. not sure when it expires. Would rather drink water than this muck! the 20 pack is the same price as the 12 pack, rediculous!!! Nice!!! Will take some of that, heat added. I hate this stuff... good price if you like it. The Export is a bit better though. Was Rob Roy from Robroyston? Must have been, I hard he drank Carlsberg too lol. Hoted the other deal that got removed, didnt know this was posted before, the wife came home with 20 30min ago. Seems like cheap big cases are the in deal now the multi buys are gone, pretty sure fosters was about the same and stella has already been posted - Always good for bbqs etc even if the weather isn't! 3,8 % ????? Cold, cold, cold !!!!! Where can you get better value for money then? I have to agree, it's hard to get drunk off Carslberg. You'll be bloated more than anything. I'd spend £2 extra and get two 'crates' of the 20x250ml Asda 'Biere De Luxe'. Really nice lager at £6.05 a pop! I have to agree, it's hard to get drunk off Carslberg. You'll be bloated … I have to agree, it's hard to get drunk off Carslberg. You'll be bloated more than anything.I'd spend £2 extra and get two 'crates' of the 20x250ml Asda 'Biere De Luxe'. Really nice lager at £6.05 a pop! So, you only drink "strong" stuff? Sounds very "chav" to me. So, you only drink "strong" stuff?Sounds very "chav" to me. Not everyone drinks beer to get drunk, Sounds like he drinks stella and wears a wife beater walking down the street yelling, safe bruv safe. I just like the taste of beer, Nothing is better than a hot summer... LOL, and a nice ice cold beer. Carlsberg tastes awful how anyone can drink it I'll never know! Carlsberg does NOT taste awfull. What you mean is, you don't like it. It's a matter of taste and some people, quite a lot in fact, like it. These are good for when you have friends over, plenty of beer for everyone and not a massive cost to yourself. Not the best quality beer in the world. Like other poeple have stated. they are great for BBQ's and party's / people coming over. cheapest around. More of the same boring comments when a beer deal is posted. If one does like the brand of beer then don't purchase! Not the best quality beer in the world. Like other poeple have stated. … Not the best quality beer in the world. Like other poeple have stated. they are great for BBQ's and party's / people coming over. cheapest around. "Great for BBQ's, party's and people comming over"
The only reason its as cheap in there as you might get shot in the carpark trying to get it! The only reason its as cheap in there as you might get shot in the … The only reason its as cheap in there as you might get shot in the carpark trying to get it!